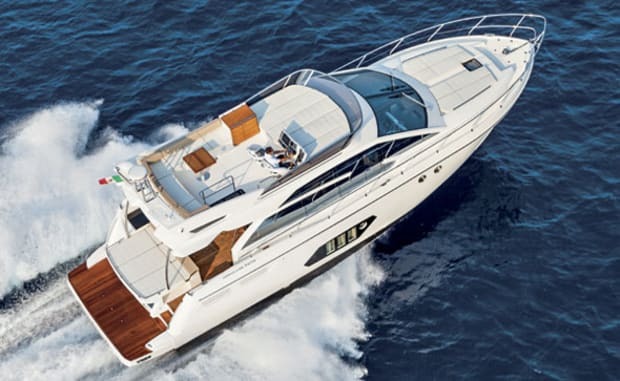 The Absolute 55 Fly combines heart-pounding performance with a large dollop of style. 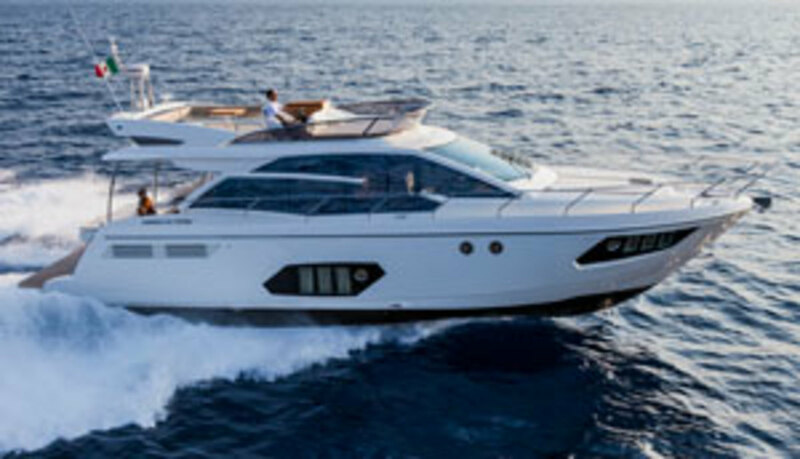 Power & Motoryacht's boat test of the Absolute 55 Fly. The IPS powered Absolute 55 Fly combines high-performance and fine living in a stylish Italian build. As we headed south out of the Marina di Genova Aeroporto the dramatic Italian coastline receded so rapidly I had to remember exactly what craft I was helming. Our boat was eating up the sparkling blue sea at such a rate I was convinced that I must be at the helm of some snarling, thrusting express cruiser, not a spacious and comfortable family motoryacht. 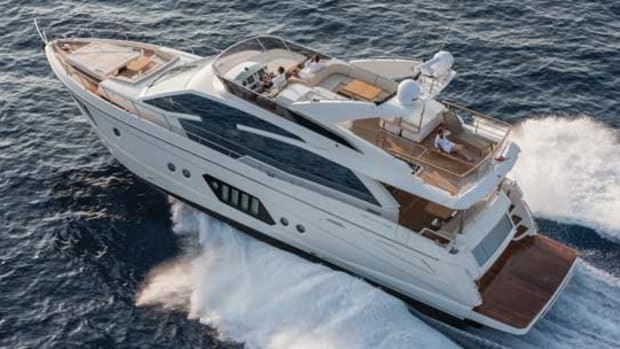 Every nudge of the throttles was met with a turbo-induced shove in the back, 20 knots flies past at 1700 rpm and before you can blink the Absolute 55 Fly is whipping along at 33 knots in a fast, comfortable cruise. The top speed during our test was a pretty astonishing 38.8 knots. It’s no coincidence that Absolute has managed to get this sort of performance from the 55 Fly. 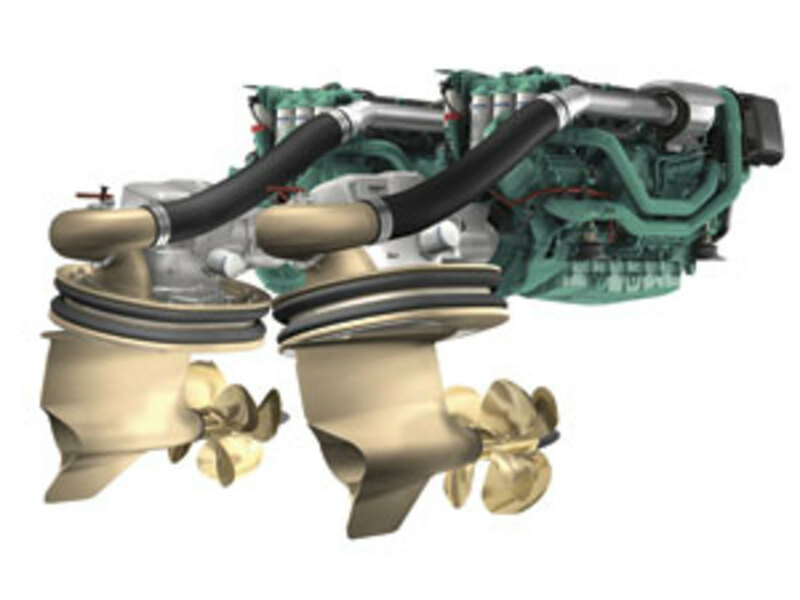 It was an early IPS adopter and has been fitting the Volvo Penta pods to its boats for six years, so the team knows a thing or two about making the system tick. 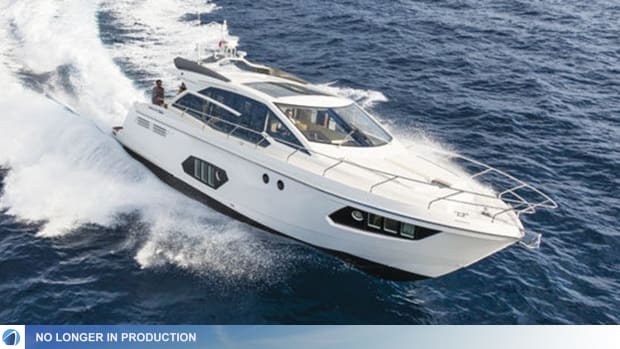 More evidence of this comes with the engine options, where you can specify double or triple IPS600s, twin IPS800s or the largest, twin IPS900s, which we had on our test boat. 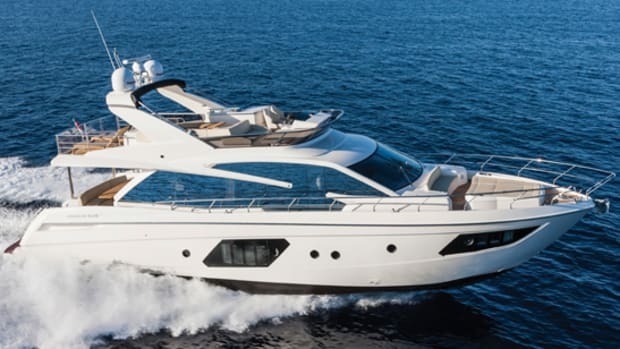 This largest option uses a pair of Volvo’s 700-horsepower D11 engines and is the one for the speed freaks out there, but Absolute offers so many machinery options you can almost tailor the propulsion to your exact taste. Only a company as comfortable with IPS as Absolute could offer so much diversity in the engine room. Absolute was one of the first yards to incorporate IPS drives into production, designing its range around the pod units. Absolute’s IPS expertise shines through in the 55 Fly’s handling as well. 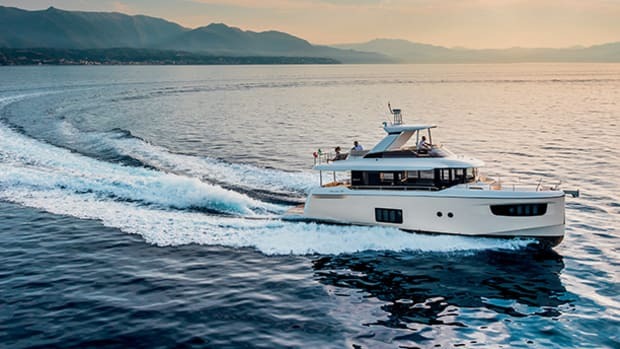 There is the risk with such a powerful and tall boat running pod drives that it could feel a little flighty from the flying bridge, but Absolute has struck the perfect balance. 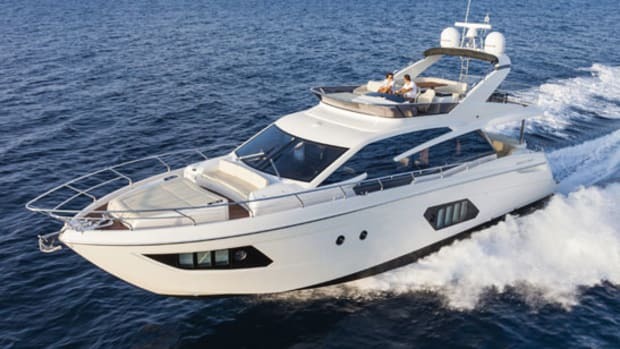 It’s responsive, fun, and engaging for the skipper without feeling like it’s going to turn around and bite you at any point. The steering is feather light without being too aggressive on the turn in and the result is large sweeping curves with just enough lean to get the blood pumping and your mouth grinning. Out of the two helm stations the one on the flying bridge is the place where I would spend most of my time. The driving position is excellent with the wheel and throttles falling easily to hand, and there’s a great line of sight over the bow no matter where you are in the rev range. I especially like the seats, which are comfortable and supportive, but also use mesh to let plenty of air circulate around you and ensure your back and legs don’t get too hot. The Raymarine chartplotter is positioned to port, in front of the navigator who is free to leave his seat without disturbing the skipper. Elsewhere on the flying bridge the layout is uncomplicated but well equipped for entertaining guests on a lazy day at anchor. The main sunbathing area is forward of the helm and benefits from the protection of the windscreen meaning the aft end is all about seating. Six to eight people could comfortably fit around the dinette for a meal and the cook wouldn’t even need to leave the top deck thanks to the bar with its fridge, sink, and barbecue grill. What’s really good about the layout of the 55 Fly is that if you do need to go down to the galley from the decks it is a short hop. Absolute isn’t the first builder to choose a galley-aft layout in the saloon, but on this boat it works really well. The sliding cockpit doors expose the galley’s aft end to both the cockpit and the elements and make interaction between the cook and those on deck very easy indeed. The galley’s design includes a small bar area, perfect for lining up drinks or grabbing a quick breakfast. The stowage is sensibly designed with dedicated slots for crockery and individual cutlery. It’s just a shame that nearly all of the drawers and cupboards onboard use friction catches instead of the sturdier locking variety, which are more dependable in a rough sea. The abundance of mirrored glass on the 55’s exterior may be a little gauche for some but you’re likely to forget about it once inside the saloon. Natural light pours in and fills every corner of the already bright interior. A section of glass adjacent to the helm opens up, giving the skipper access to the decks and a great way of communicating with crew on the bow. However, Absolute’s eye for practical detail falls short in places. The ergonomics aren’t as good as the upper helm—the wheel and the throttles are too much of a stretch when seated. The analog dials are easy enough to see but the horizontal engine data screens are difficult to read at a glance. And when you are up to cruising speed there are too many unwanted rattles and squeaks emerging from the dash. We took some nasty slams in the light chop, which felt fine from the detached comfort of the flying bridge but they jarred from the inside. General engine noise is a little too high for normal conversation at higher cruising speeds as well. Adjacent to the helm is a small lounging area. Its raised location makes it a lovely spot for a coffee with a view. Aft is the main seating area, where you’re most likely to dine both because of the space and the fact that it’s next to the galley and therefore easy for the cook to serve guests. Belowdecks there is a fairly standard three-cabin layout but there is nothing standard about Absolute’s clever use of glazing in the master and VIP cabins. Both cabins get three huge panes of glass on either side plus a round opening port to provide some breeze. 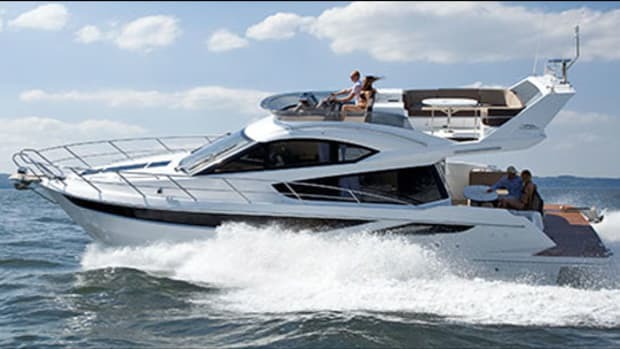 The effect is staggering, especially in the VIP where the slightly smaller cabin footprint means that you feel even closer to the water. There’s no better way to give your guests the five-star treatment. One of the best spots on the boat is in the master cabin, where there is a cozy two-person booth beneath the starboard windows for the owner and his significant other to have a quiet breakfast in private away from the kids or guests. Since it’s at water level it feels like the most exclusive waterside apartment you could wish for. 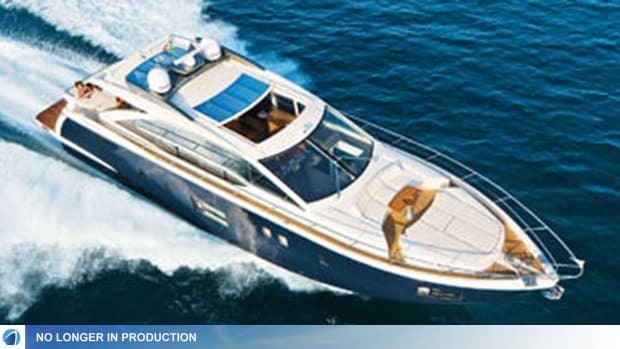 The boat has two heads, one en suite solely for the owner and one shared by the VIP and the spacious twin guest cabin. Both heads are generous inside and splashes of class like the teak grating and stone-effect Corian surfaces make them feel that much more special. 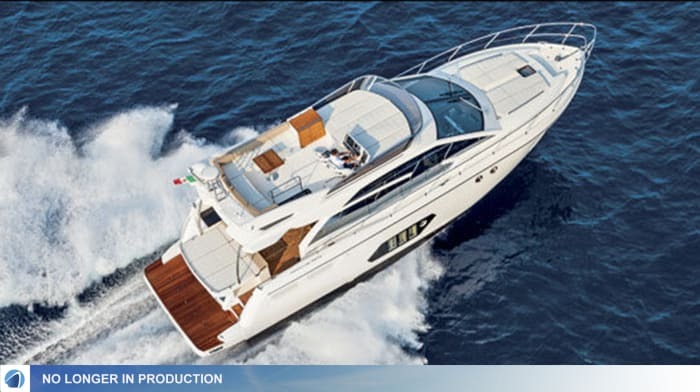 The Absolute 55 Fly flies the Italian flag with fierce competition from within her own country and the rest of Europe. 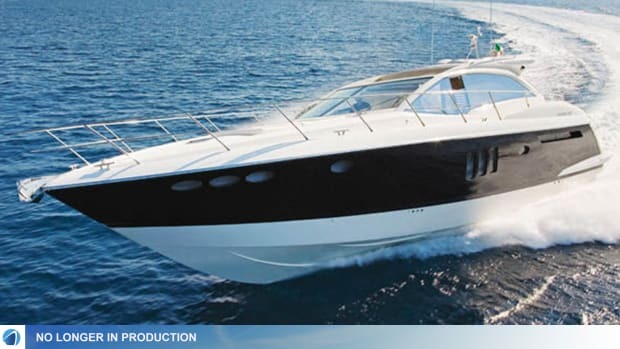 Some will ask why you would buy this boat over esteemed European marques like Sessa, Azimut, or Princess. Well she’s an individual, for one, and you’re not going to see many on the water like her. And then there’s the magic that Absolute has worked in the engine room. As a customer you have so much choice when it comes to engine options that there is bound to be a setup that suits your every need. 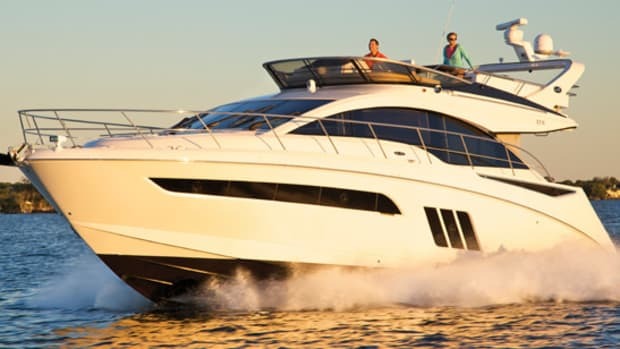 Yes, the lower helm needs some attention and the squeaking interior spoils the party a bit, but you know that if someone in a flashy sports cruiser roared up alongside you and demanded a drag race, you could nail the throttles and take them on with ease. 250 gal. fuel, 188 gal. water, 5 persons.